Nineteenth-century Sierra Leone presented a unique situation historically as the focal point of early abolitionist efforts, settlement within West Africa by westernized Africans, and a rapid demographic increase through the judicial emancipation of Liberated Africans. Within this complex and often volatile environment, the voices and experiences of children have been difficult to trace and to follow. Enslaved children historically are a challenging narrative to highlight due to their comparative vulnerability. This book offers newly transcribed data and fills in a lacuna in the scholarship of early Sierra Leone and the Atlantic world. It presents a narrative of children as they experienced a set of circumstances which were unique and important to abolitionist historiography, and demonstrates how each element of that situation arose by analyzing the rich documentary evidence. By presenting the data as well as the individuals whose lives were affected by the mission schools (both as teacher or pupil) this study has sought to be as complete as possible. 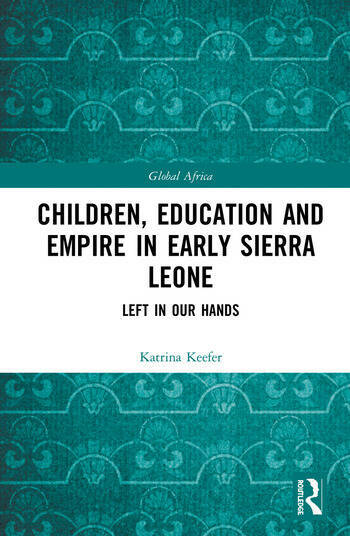 Underlying the more academic tone is a recognition of the individual humanity of both teachers and students whose lives together shaped this early phase in the history of Sierra Leone. The missionaries who created the documents from which this study arises all died in Sierra Leone after having profound impacts on the lives of many hundreds of pupils. Their students went on to become important historical figures both locally and throughout West Africa. Not all rose to prominence, and the book reconstructs the lives of pupils who became local tradespeople in addition to those who had a greater social stature. This book attempts to offer analysis without forgetting the fundamental human trajectories which this material encompasses. Katrina Keefer is Adjunct Professor of History at Trent University, Canada.